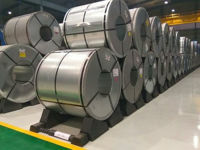 The KLP® Coil Carrier Connect has been developed by Tata Steel Holland, P.T.C. Logistics and Lankhorst Mouldings. P.T.C. 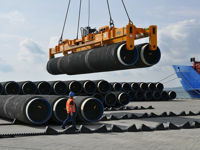 transports coils for Tata Steel with river barges, using the vast Dutch and Western European river network. 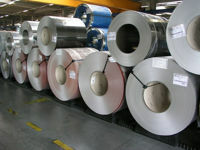 They carry coils from Tata Steel works to customers, whereas the return ship concerns other cargo (like bulk products). Therefore P.T.C. was looking for a sustainable coil storage system that can easily be installed and removed from the ship’s cargo bay, replacing their old-fashioned wooden chocks. Reusable heavy duty carriers for safe and protected transport of your coils. The KLP® 4-way Coil Carrier was developed as a reusable carrier for transport of coils with a horizontal axis. It was designed in such a way that a forklift truck may enter from four directions. Based on the experience with our KLP® RollStop System, Lankhorst has developed the KLP® PipeStop System. This Pipe Storage System consists of a steel reinforced rail with notches and blocks (the Pipe Stops), which can be placed at different distances from each other, depending on the pipe diameter. 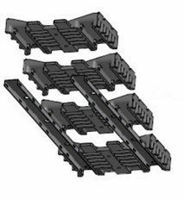 The RollCradle System from KLP® consists of a reinforced plastic rail with notches and blocks (Roll Cradles) which can be placed at different distances from each other, depending on the coil diameter. 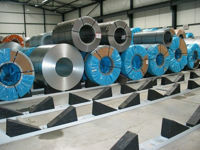 The rounded-off solution for coil transport The KLP® Rollpallet® was designed to improve means of transport and storage of coils with the eye to the sky. 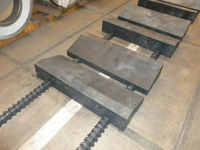 Standard sized roll pallets are suitable for coils with diameters ranging from 940 mm to 1760 mm diameter. Developed back in 2005, today already our most popular coil storage system chosen by all major steel companies world wide. It is a turn-key storage system offering maximum flexibility and maximum safety. Coils may be stored up to three levels. The KLP® Roll Stop System consists of four simple components: rail, connector, spacer and RollStop - this allows a very simple installation on-site.